ROI Signature Membership has an annual fee of $99 but NPEA members get the signature Membership for Free! Members save an average of $25-50 per reservation per night while using this membership. The Premium Membership has a slightly higher annual fee at $239 and NPEA members get the premium Membership for a discounted rate of $99 per year. Members save an average of $50-100 per reservation per night while using this membership. Premium Members will start seeing a return on investment after 3-4 reservations. Due to the higher percentage of savings, it is highly advisable to take advantage of our Premium Membership if you plan on making over 3 reservations this year. The return on investment will pay for itself and continue to pay dividends the more often you are making reservations. Take a peek at the inside here to compare rates now and see how much you can save. Just remember the rates you see on ROI include all taxes and fees, so when you compare make sure you go to the checkout page on sites like Expedia and Hotels.com to see their full price. Looking to get away without emptying your wallet? We’ve made it simple for members to receive the best rates on rental cars and hotels. ROI Travel Club offers members direct access to the lowest wholesale rates on hotel rooms from over 400,000 hotels and resorts. Plus, you’ll find great deals on cruise lines, such as Carnival and Celebrity. All rates at true lowest price with 100% of the commissions passed through to you. 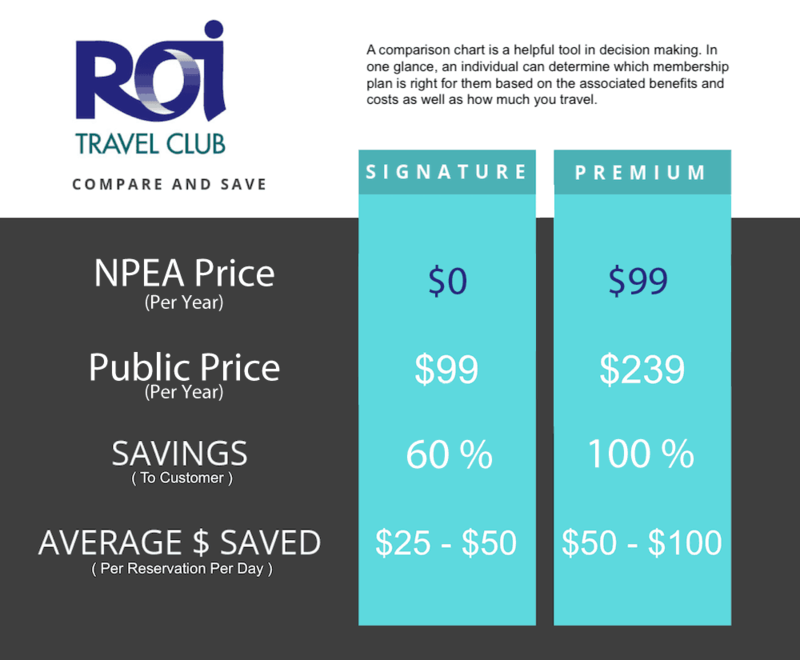 The price you see on ROI Travel Club is the price you pay. Some sites show you a price and then add taxes and additional fees when you checkout, but ROI includes taxes in their discounted price, this is good to know when comparing rates! ROI also has a 110% guarantee, meaning they will credit you 110% of the difference if you find a cheaper hotel.